Sennacherib was King of the Universe, King of the Four Corners of the World, and King of Assyria. From his lofty perspective on a throne in Nineveh, just outside the modern Iraqi city of Mosul, those titles all meant the same thing: unparalleled power. Nineveh was the largest city in the known world in Sennacherib's day, about 700 B.C., and his palace one of the grandest, its walls decorated with reliefs depicting his feats in war and engineering. Art historian John Russell knows those walls well. Just before the last Gulf War, he photographed thousands of feet of carved reliefs covering Sennacherib's 90-foot-long throne room. So he was shocked when, in 1995, he saw them for sale, chopped into pieces and chipped down to look like separate finds. Sennacherib's magnificent palace had been reduced to piles of rubble by looters intent on selling off the art--a sadly common symptom of more than a decade of chaos that has devastated Iraq and some of the world's richest cultural resources. The destruction is documented in Russell's book The Final Sack of Nineveh. Says the Massachusetts College of Art historian: "Tens of thousands of pieces have come out, mostly looted from places that have never been excavated properly. This is just a tiny part of a huge problem." The problem may get even worse as new conflict looms. Known as the cradle of civilization, Iraq's river valleys house some of the world's oldest cities. Sites like Ur, Nineveh, and Nimrud are powerful draws for archaeologists seeking clues to the origins of civilization and biblical scholars looking for the historical foundation of Old Testament stories. The region also has been home to the center of the Islamic world with majestic mosques and shrines like those of Samarra, as well as Persian-influenced sites like Ctesiphon. As troops gather in the region once again, archaeologists are mobilizing along with them. "These sites, standing monuments, and museums must be protected," says Ashton Hawkins, president of the American Council for Cultural Policy, a group of preservationists, art historians, and archaeologists that has met with State Department and Department of Defense officials in recent weeks to express its concerns. "Iraq's cultural patrimony is the world's." In an area continuously inhabited for over 5,000 years1, the concentration of ruins is remarkable. Ancient cities were built of mud brick, and as they collapsed later buildings were layered on top. After centuries of rebuilding, the mounds formed by these ancient settlements--known as tells--sometimes rise eight or nine stories above the otherwise flat, featureless desert. That very prominence, however, has put the tells in a dangerous position. The man-made hills are natural sites for radar installations or antiaircraft guns--and hence natural targets for bombing raids. That presents a quandary for military planners balancing tactical decisions against preservation needs, because resources like tells are protected by the 1954 Convention for the Protection of Cultural Property in the Event of Armed Conflict, a treaty the United States has not signed but respects. That respect was sorely tested during the Gulf War, when two Iraqi jets were parked next to the ziggurat of Ur, reputed to be the birthplace of the biblical patriarch Abraham. "You can target those jets if you want to, knowing full well there would be collateral damage," says Scott Silliman, a Duke University law professor who served as an Air Force lawyer during the Gulf War. "When you move a military objective right next to what is otherwise protected under international law," the military has a right to fire. But, Silliman adds, "the commander must also weigh the consequences. If the damage far outweighs the military value of the target, it's not worth it." The ziggurat was spared, though bombs did fall nearby. "We spend more money than anyone in the world trying to avoid collateral damage," says Department of Defense spokesman Dan Hetlage. "It's important that Iraq's monuments be protected, and our forces will be instructed to act accordingly." So wrote Byron of the siege of Jerusalem, undertaken by the Assyrian king Sennacherib in 701 B.C. from Nineveh [IMAGE, 37K], capital of the greatest empire the world had ever known. For two and one-half millennia, the only known account of this momentous event was in II Kings 18-19, which reports that Sennacherib's invincible army was laid low by the angel of the Lord, after which Sennacherib returned to Nineveh where he was murdered by his sons. Nineveh itself fell to the Medes and Babylonians in 612 B.C., its splendor buried under the shifting dust of northern Mesopotamia. In 1847 the young British adventurer Austen Henry Layard explored the ruins of Nineveh and rediscovered the lost palace of Sennacherib across the Tigris River from modern Mosul in northern Iraq. Inscribed in cuneiform on the colossal sculptures in the doorway of its throne room was Sennacherib's own account of his siege of Jerusalem. It differed in detail from the biblical one but confirmed that Sennacherib did not capture the city. This find generated an excitement that is difficult to imagine today, because amid the increasing religious doubt and scriptural revisionism of the mid-nineteenth century, it gave Christian fundamentalists an independent eyewitness corroboration of a biblical event, written in the doorway of the very room where Sennacherib may have issued his order to attack. The palace's interior walls were paneled with huge stone slabs, carved in relief with images of Sennacherib's victories. Here one could see the king and army, foreign landscapes, and conquered enemy cities, including a remarkably accurate depiction of the Judean city of Lachish, whose destruction by the Assyrians was recorded in II Kings 18:13-14. Considering that the palace had been destroyed by an intense conflagration during the sack of Nineveh in 612 B.C., the massive walls and many of the relief sculptures of Sennacherib's throne-room suite were surprisingly well preserved. In the 1960s, because of the palace's historical importance and unique preservation, the Iraq Department of Antiquities consolidated the walls and sculptures and roofed the site over as the Sennacherib Palace Site Museum [IMAGE, 37K] at Nineveh, where visitors could tour one of only two preserved Assyrian palaces in the world. (The other is the palace of Assurnasirpal II at Nimrud, also restored as a site museum.) The four restored rooms of the throne-room suite, designated H, I, IV, and V by Layard, contained some 100 sculptured slabs in various states of preservation. In two of these rooms, IV and V [IMAGE, 51K], parts of nearly every slab survived, making these the most completely preserved decorative cycles in the palace. Most of these reliefs have never been published. Some show unusual subjects and provide valuable information on visual narrative composition in Assyrian palace decoration. These reliefs needed to be documented in case the originals were lost or damaged and to guide future conservation efforts. As a member of the University of California, Berkeley, team at Nineveh in 1989 and 1990, I took roughly 900 photographs of the remains of the throne-room suite. One of my main objectives was to record the surviving sculptures in detail. An example will give some sense of what this project accomplished. In Nineveh and Its Remains (volume 2, page 469), Layard published an engraving of a unique representation in which two Assyrians make an offering before two standards in the form of horned dragons or serpents attached to poles [IMAGE, 86K]. This image is of considerable interest for the study of Assyrian cult practice, but Layard did not indicate which room or slab this scene was from, nor did he give any indication of its size, and the original drawing from which the engraving was made has not been located. My documentation showed that this image is a detail from Slab 43 of Room V [IMAGE, 81K]. As can clearly be seen from the new photograph, the context of this scene is Sennacherib's military camp on a campaign in a mountainous region. The heretofore unpublished slabs on either side show further events from the campaign, placing this small detail within its larger visual narrative context. The necessity of documenting the site became devastatingly clear in late summer 1995, when I was shown a fragment of an Assyrian relief now for sale on the antiquities market [IMAGE, 92K]. There is no doubt that this fragment came from this same slab, which was intact in the Nineveh site museum in 1990 [IMAGE, 130K], but which has since evidently been broken up by looters. Soon thereafter, I was shown photographs of two more fragments that had been in storage at Nineveh in 1990, but which are now also on the art market. One, from Hall XLIX of Sennacherib's palace (Russell 1991, fig. 86), shows laborers towing a load toward the right [IMAGE, 89K]. The other, which is more unusual, shows two dead sheep and a dead man floating in water [IMAGE, 90K]. I know of no occurrence of domestic livestock shown this way, other than a fragment that shows a dead buffalo in the water, which was found by George Smith during his excavations at the west end of the palace in 1874 (Smith 1875, p. 148). Both of these fragments may have belonged to the campaign to the Persian Gulf that R. C. Thompson, who excavated at Nineveh in 1904-1905, said embellished the west facade of the palace (Thompson 1929, p. 61). It proved impossible to determine who was offering these three fragments for sale, or where they were being kept, so I published a note in IFARreports to alert prospective buyers that these sculptures had been stolen from the site museum at Nineveh (Russell 1996). These fragments would be poor investments. Since Iraqi law prohibits the export of antiquities from Iraq without an official permit, and since these sculptures have no such permits, Iraq would have clear legal grounds to reclaim them from any purchaser. Furthermore possession of these fragments is a violation of the United Nation sanctions against Iraq, which means that they could be confiscated by customs authorities. I was concerned that more looted Assyrian sculptures would appear on the market but saw no further examples for more than a year. In November 1996, I was contacted by a lawyer acting on behalf of a prospective purchaser who had photographs of ten Assyrian sculptures that were said to be on the market. The lawyer wanted to know if the sculptures were being sold legitimately. They were not. Nine of the ten new pieces are fragments of wall relief from the Sennacherib Palace Site Museum. All nine fragments had been broken from large wall slabs that were intact in the museum in 1990. They had not merely been broken from the edges of a few slabs. Each fragment came from a different slab, and most of them had been broken from the middle of a slab, suggesting that the looters extracted the best-preserved bits, destroying the remainder in the process. Formerly intact and partially intact slabs are now apparently piles of rubble. The tenth fragment is evidently from the palace of Sargon II at Khorsabad, which was being stored at Nineveh in 1990 [IMAGE, 59K]. The nine new Sennacherib fragments are illustrated here, along with the slabs from which they were broken. The illustrations of these fragments are of poor quality because I was only given photocopies, and I have been unable to locate a set of the original photographs. 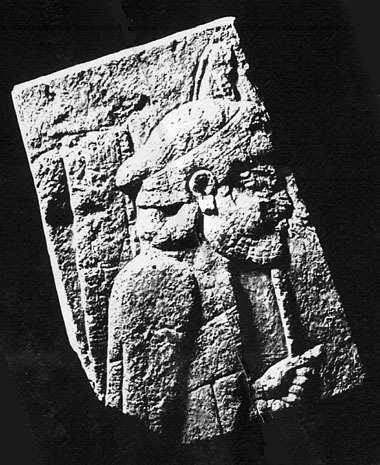 At least three of the relief slabs from which these fragments were broken have been illustrated in situ in the site museum, slab I:7 [IMAGE, 62K] by Russell (1991, fig. 28), and slabs I:24 [IMAGE, 68K] and V:1 [IMAGE, 51K] by Madhloom (1976, pl. 32, 33a), the excavator of the palace. The method by which large wall slabs were converted into small marketable fragments is noteworthy. As mentioned already, each piece is a portion of a large slab. In cases where the surrounding surface was not well preserved, these parts were broken away to create a well-preserved fragment, as on slabs V:15 [IMAGE, 71K] and V:39 [IMAGE, 70K]. A similar case is a fragment (IV:4 [IMAGE, 52K]) that shows small figures behind a city wall. On the original slab, which was preserved to its full height, there were large figures of soldiers directly above the city [IMAGE, 62K]. These were completely broken away, evidently so that their large scale would not distract from the interest of the miniature scene below. In several cases (I:24 [IMAGE, 59K], V:1 [IMAGE, 66K], and V:39 [IMAGE, 81K]) fragments were squared off to give the impression that these are complete, self-contained compositions. All of the fragments were mounted vertically on bases, in some cases without respect to the sculpture's original orientation. Fragment V:1 was squared off diagonally and then mounted vertically, so that the figure now seems to be falling forward, quite unlike its original position on the slab. Whoever mounted the fragments knew so little about Assyrian art that they did not realize that a lozenge pattern in the background, which represents mountains, is always oriented vertically. Fragment V:17 [IMAGE, 60K], which shows a cowering crouching figure, is mounted so that the man is oriented as if standing, with the result that the mountain pattern angles to the left. Fragments V:39 and I:16 [IMAGE, 69K] are also tilted. The most dramatic example of this is fragment V:16 [IMAGE, 61K] that showed a pair of archers shooting toward a city on top of a mountain. The piece was mounted so that the archers shoot horizontally, with the mountain pattern almost horizontal behind them. All of these examples of trimming and reorienting show how important context is in understanding the significance of each fragment, and how much crucial information is lost in the breaking up of a sculptured slab into fragments for the antiquities market. Not only is a unique cultural artifact destroyed, but even the fragments that remain are reduced to incomprehensible ciphers, the meaning of which is lost with the destruction of the full composition. Why is this happening now? Iraq has a rich and varied heritage, and this heritage has been coveted by the Western world since the nineteenth century heyday of imperial acquisition. Then, "like the wolf on the fold," representatives of European governments descended on the palaces of Mesopotamia and sacked them to fill the halls of the British Museum, the Louvre, and the Berlin Museum. Numerous sculptured slabs found their way into smaller collections in England and America as well. The most spectacular of these was a group of 28 Assyrian sculptures, including two human-headed lion and bull colossi, which were presented by Layard to his cousin, Lady Charlotte Guest, a distinguished scholar of Welsh literature, mother of ten, and wife of the wealthiest industrialist in England. She displayed them at her home, Canford Manor in Dorsetshire, in the Nineveh Porch, a Gothic Revival garden pavilion built especially for them by Charles Barry, the architect of the Houses of Parliament. The bulk of this collection is now in the Metropolitan Museum of Art in New York. Their story is told in my new book, From Nineveh to New York (Yale University Press), which will be published in March 1997. Today Assyria is in fashion again, and its sculptures are bringing unprecedented prices. In 1992, while doing research for the new book, I discovered an original sculpture still in place in the Nineveh Porch at Canford, now Canford School. In 1994 this sculpture was sold by the school at auction for $12 million, by far the highest price ever paid for an antiquity. To protect and promote its irreplaceable heritage, modern Iraq has an excellent antiquities department, and the people of Iraq have a very high level of pride in their national heritage. In the recent past, very few antiquities left Iraq, because every Iraqi carefully guarded that heritage. This attitude is essential for a country that possesses hundreds of major archaeological sites and tens of thousands of smaller ones. Even in the best of times, it would be impossible to guard all these sites without the cooperation of the Iraqi people. Under the United Nations sanctions against Iraq, resources have been diverted from nonessential areas such as the preservation of antiquities and heritage at the same time that newly impoverished Iraqis, squeezed between ruinous inflation and critical shortages of basic necessities, have been forced to seek new sources of subsistence income. For antiquities and heritage, the combination of local desperation and international demand is a recipe for disaster. Some Iraqis with nothing left to sell have evidently turned to selling off bits of Iraq's rich heritage. These relatively small fragments would be easy to conceal and smuggle out of Iraq, most likely through the Kurdish territory only a few miles to the north of Mosul, but also possibly through Iran, Turkey, Syria, Jordan, or Saudi Arabia. They then might be warehoused until a buyer could be located. There is no evidence that Iraqi officials are involved in these thefts. Instead, this appears to be disorganized pilfering, probably carried out by desperate locals, and the sculptural fragments are very likely sold for a pittance, since such well-known pieces have no value on the international market. "Like the wolf on the fold," the United Nations sanctions against Iraq have finally destroyed Sennacherib's palace, finishing the work begun by the ancient Medes and Babylonians who sacked Nineveh in 612 BC. To be sure, market and political forces are also at work here, but the fact remains that without the sanctions, this destruction would not have happened. Today the Sennacherib Palace site museum at Nineveh represents a world heritage disaster of the first magnitude. Immediate emergency conservation measures are required to preserve what remains of its sculptures. One might think that international support for such a crucial undertaking could be readily obtained, but the obstacles appear insurmountable. The same United Nations sanctions that have contributed to the destruction of the palace museum also prohibit any form of outside cultural assistance to Iraq. The United Nations sanctions committee has repeatedly refused to grant permission for international teams to assess damage and threats to the cultural heritage of Iraq in the wake of the Gulf War, despite the urgent need for documentation and conservation of Iraqi heritage due to wartime damage, postwar looting, and emergency agricultural development. Even if money and expertise could be obtained for the preservation of the palace museum the sanctions prohibit its expenditure in Iraq. This hostility towards Iraq's heritage reflects a widespread misunderstanding in the west, which fails to make the connection between modern Iraq and ancient Mesopotamia, the "Cradle of Civilization." This heritage disaster also highlights the role of the west as a myopic consumer of heritage, rather than cherishing it as a vanishing irreplaceable shared resource. I do not know where these sculpture fragments are or who has them. Anyone who is offered them for purchase is requested to notify the seller that the sculptures were removed illegally from Nineveh, and to ask the seller to turn them over to an Iraqi embassy or interests section, Interpol, or to a customs agency, so that they may be returned to Iraq. Potential buyers of Sennacherib fragments should be aware that very few such pieces appear legitimately on the market, and that many more fragments may have been smuggled out of Iraq, either from relief slabs known to have been broken up, or from other slabs in the palace museum. Any Sennacherib relief fragment should be treated with great caution. Archaeologist Peter A. Miglus of the University of Heidelberg stands on the remains of a wall of a late-Assyrian palace in Ashur, Iraq, with the Tigris River in the background in 2001. An Iraqi dam under construction on the Tigris River threatens to submerge the remains of the spiritual capital of the ancient Assyrian empire in an act archaeologists liken to flooding the Vatican. MUCH OF the city of Ashur, which thrived for more than 1,000 years until the Babylonians razed it in 614 B.C., could vanish under a lake to be created by the Makhoul dam, U.S. and European archaeologists said. More than 60 outlying historical sites are also threatened. Ashur, or Assur, was of such importance that it lent its name to the Assyrian civilization itself. “Losing it would be like, I guess you could say, losing the Vatican,” said Mark Altaweel, a Baghdad-born doctoral student at the University of Chicago who is using satellite data to study the ruins-rich region surrounding Ashur. Ashur sits on a bluff about 130 feet (40 meters) above the Tigris between Mosul and Baghdad. Most of the city, including the lower portions most vulnerable to flooding, have never been explored in the century since the first archaeological teams visited the site. The city was the spiritual center and trading hub of one of the world’s first great empires that at its peak stretched from Egypt to Iran and northward into Turkey. From that day on, the monkeys played by day and slept in the cave by night. They accepted the stone monkey as their king. The stone monkey started to call himself "Monkey King", casting off, for all time, the word "stone". A 30,000-year-old engraving of a woolly mammoth by people who saw the creature firsthand. Feb. 5 — Russian scientists said Wednesday that they've found living cells in a frozen ice-age mammoth that could provide the DNA needed to resurrect the long-extinct tuskers. Cells obtained from the well-preserved legs of a mammoth found last summer in Russia's far-northern Yakutia region are "conditionally alive," said Vladimir Repin of the Vektor Research Center for Virusology and Biotechnology. The cells were fixed in formalin, an aqueous solution of formaldehyde, immediately after the finding, said Repin. The inner structure of the cells is undamaged, "so we suggest that the rest of the frozen tissues contain similar cell layers which could be unfrozen," Repin explained to the Informscience news agency. Repin said that the living cells could prove to be good for cloning purposes. "The cell material is unique because it contains not just intact mammoth DNA but whole cells which have been perfectly preserved for 10,000 years," the Vektor press service said. The latest finding comes as a boon to a group of Russian and Japanese scientists who are planning to revive the mammoth once they can find usable DNA material. The team, led by Japan's Kazufumi Goto, a former professor of reproductive physiology at Kagoshima University, said last August that it would be "technically possible" to produce mammoth calves using the DNA and artificially inseminating an elephant cow. The mammoth remains — still covered in reddish fur — were found frozen in the soil next to a riverbank near Yakutsk. The research team washed the remains using a water jet before placing them in a freezer and transporting them to Yakutsk's Mammoth Museum, Informscience said. Goto hopes that by using good DNA from an ice-age mammoth he will be able to produce a hybrid of a mammoth and an elephant. By impregnating each female hybrid with mammoth DNA, Goto believes he can produce a mammoth-elephant hybrid in which the original mammoth would predominate in its genetic constitution. The Japanese researcher hopes that the resurrected mammoths will live in a sanctuary in an uninhabited area north of the remote, frozen Kamchatka peninsula in Russia's Far East, where present conditions resemble their original habitat.